Monochrome painting, that is, the grisaille, is a plain figure, for example, black-and-white or brown-white. This kind of painting was very common in the middle ages in easel painting. Grisaille is a special kind of painting. Its implementation is the tonal gradations of the monochrome. Thus it is convenient to draw the reliefs, any architectural or sculptural elements. When grisaille technique takes into account only the tone of the depicted object, color in this case indifferent. Art grisaille – a work whose purpose is to approve the aesthetic value of monochrome color of the picture. Monochrome painting is a bridge between painting and drawing. 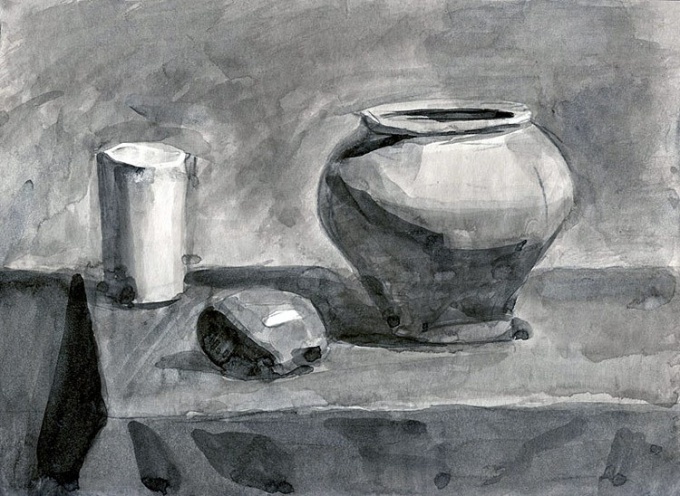 For those who are just starting to learn painting, grisaille, as a rule, becomes the first learning task. The most difficult part for beginners is the transmission tone by color. The color of the object, any person, having no defects in visual perception, called easy. But as for tone, it is difficult to determine how objects relate to each other – that one is darker or lighter and by how much. If you have trouble with this, you can use a simple logic – subjects close, brighter and more contrast, those in the distance, the tone are more blurred and uniform. To solve the problem of modeling of light and shadow much easier if you use one color. The word "grisaille" comes from the French word Gris – grey. Most often this kind of painting is found in black and white. The reason is that first the grisaille was intended to mimic the sculpture, that is, the reliefs on the walls. But over time it found its place in the so-called "easel" painting, first as an auxiliary tool for thumbnails, then as a separate kind of painting. Gradually we have expanded the palette is a colour called Sepia - it had been made from the ink sack of the cuttlefish, clam. It was used for drawing and brush, and pen. Then there were red and blue variants. When choosing colors, the artist relies primarily on the intention of the piece. In the black-and-white artists are able so accurately to take tonal relationships and the nuances to play, making it feel and flavor of the product, and coloring objects individually. Grisaille gives the ability to dream, presenting the picture in any possible color interpretation. Contemporary artists choose to grisaille the color that corresponds to the plan. Important is the principle of single-color images. In grisaille is only the tone of the subject, and its color does not matter.